A gear rack is fundamentally the same to a spur gear, but the technique is linear. A gear rack involves teeth equally spaced along a straight line. A pinion is put at the top of the gear rack, and the linear nature of the gear rack converts the pinion's rotary motion into linear motion. 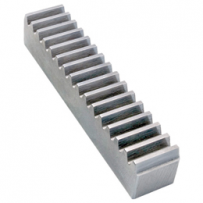 Rack styles include straight (spur), helical, integrated and round. We provide racks in various steels such as C45, C50 or according to your demand. We also supply stainless steel toothed racks. Stainless steel racks and gears are commonly used for their strength to weight ratio, corrosion resistance and durability. They are available in 303, 304 and 316 stainless and can be treated by vacuum hardening or kolsterising.